UGA’s Mike Bobo is expected to be named the new head coach of the Colorado State Rams, the Coloradoan and other outlets have reported. BREAKING #UGA OC Mike Bobo is expected to accept the head coaching job at #ColoradoState, source tells @FoxSports. Colorado State has yet to announce the hiring and UGA has not yet announced that he is leaving, however. Mike Bobo reportedly interviewed with Colorado State on Wednesday and then returned for a second interview on Sunday. The CSU job opened up in early December when head coach Jim McElwain left for the same position with the Florida Gators. 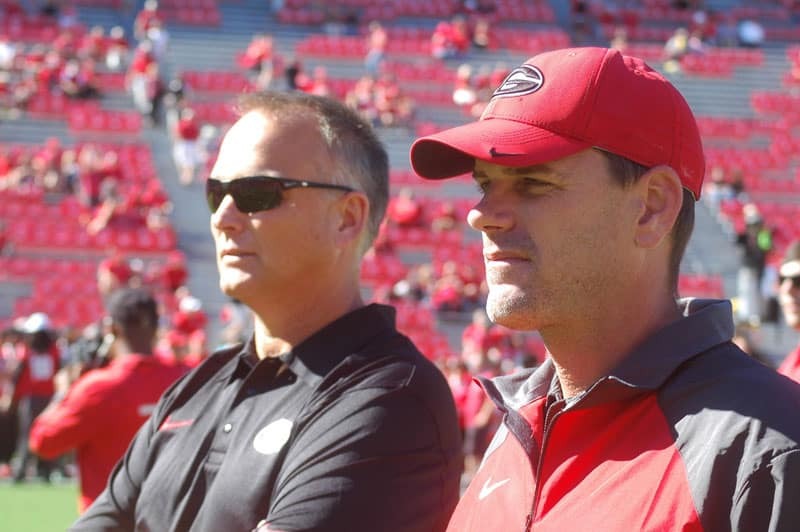 Mike Bobo, UGA’s offensive coordinator and quarterbacks coach, has been in Athens since 2001 and earns an annual salary of $575,000. That ranks 40th among assistant coaches nationwide and 16th in the SEC. Some reports have indicated Bobo’s salary at Colorado State could be near $2 million annually, but that is just speculation at this point. If his salary is even close to that, you can see why he is leaving to take the position. Some will, of course, question if Greg McGarity and the UGA administration offered to renegotiate Bobo’s contract and pay him in excess of $1 million. But this could simply be about Bobo’s desire to become a head coach at a smaller school with hopes of returning to Athens to lead Georgia after Richt retires. If Bobo is in fact leaving for Colorado State, the question becomes who will Richt hire to replace him? A few names mentioned by UGASports.com include James Coley (Miami, FL OC), Doug Meacham (TCU OC), and Billy Napier (Alabama WR’s). During and after a new offensive coordinator is hired, a major task will be to keep the current recruits that Bobo is responsible for, primary the No. 1 quarterback in the country for the 2016 class, Jacob Eason. A Pac-12 OC just text me, “The line to speak w Richt about OC job will be long” – Yes, yes it will.